In Asia, the culture of conchocelis starts around mid spring (March/April). In nature, the conchocelis phase grows within oysters, mussels, clams, or scallop shells. However, in Japan, artificial substrata made of transparent vinyl films covered with calcite granules, are beginning to be used as substitute for mollusk shells. Usually, the oyster shells or artificial shells are placed on the bottom of shallow tanks filled with seawater for seeding to take place (Figures 1a-1c). 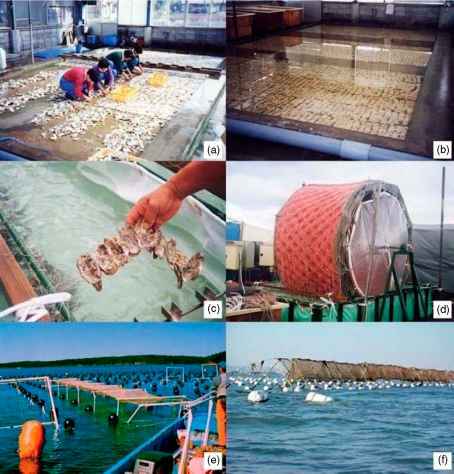 Figure 1 (a-d) Culture of conchocelis on oyster shells and rotary wheels for seeding of nets. (e) Nursery culture of Porphyra in Japan Ikada system. (f) Floating 'A' frame system in China. (a-d) Courtesy of M. Notoya. (e) Courtesy of I. Levine. (f) After X. G. Fei. Seeding may be accomplished by introducing chopped pieces of fertile (ripe) Porphyra blades into the seeding tank, which are removed after the release of the zygotospores. The zygotospore suspension can be pre pared artificially by air drying the fertile thalli overnight and then immersing them in seawater for 4-5 h the next morning (this will induce mass shedding of zygotospores) or by grinding the fertile blades and separating the suspension of zygotospores by filtration. The zygotospore suspension is then introduced into the seeding tank, where the spores settle on the calcareous substrate. An alternative method, growing in popularity, is the mass cultivation of conchocelis that is then seeded directly on calcareous substrates. The advantage of this technique is the use of defined strains that give a more consistent crop. In each case, the seeded substrates are kept in large tanks (0.25-0.5 m deep). The shell substrates are either hung vertically or spread across the bottom. The conchocelis is allowed to develop during the rest of the summer under low light levels (25-50 p,mol photons m 2s *), at 16:8h L:D and at 23 °C. Recently, bioreactors have been developed for the culture of 'free living conchocelis' of native North American Porphyra species in laboratory. In this method, clones of conchocelis are vegetatively propagated to produce enough biomass for mass production of conchos pores. Large amounts of conchocelis can be produced and maintained in bioreactors under controlled temperature, light, photoperiod, and salinity. The conchocelis are induced, in mass, to produce reproductive fat filaments, forming conchosporangia and conchospores. The process is less cumbersome and requires less labor. Mass release of conchospores can be induced as needed and seeded onto nets.